All right, you know the drill - 1 page front cover, 1 page editorial/SRD, 1 page content, so let's take a look! 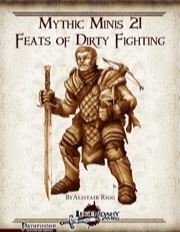 This Mythic Mini about dirty fighting provides 7 new mythic feats, so what do we get? -Adder Strike: Penalize saves versus Adder Strike-delivered poisons, use mythic power to make the poison last for multiple rounds. -Broken Wing Gambit: You need only hit touch AC, but only deal damage when hitting regular AC. Use one mythic power to allow one ally per 2 mythic tiers to allow allies to make AoOs by expending your immediate action as if they had Broken Wing Gambit. -Drag Down: Deal unarmed damage in addition when tripping foes. Also, keep foes prone while prone yourself. Neat! -Felling Smash: Felling Smash as a free action, or sans Power Attack penalty as a swift action. If you already may mitigate said penalty in favor of better tripping. This one's wording is slightly ambiguous and could have potentially been phrased slightly more concise. -Pinpoint Poisoner: Add unarmed damage to blowgun dart damage(+poison) and resolve close range shuriken-style throwing of darts as touch attacks; Can be enhanced via mythic power. AWESOME. -Punishing Kick: Increase DC by 1/2 tier, target may end up in unsafe squares and you may bull rush multiple foes. Mythic power can be used as a resource for daily punishing kicks. Neat! -Vicious Stomp: Use mythic power as swift action to make unarmed attacks against prone targets. Also makes standing up harder from being stomped. Editing and formatting are top-notch, I didn't notice glitches. Layout adheres to legendary Games 2-column full-color standard and the cover-art is neat. The pdf has no bookmarks, but needs none at this length. 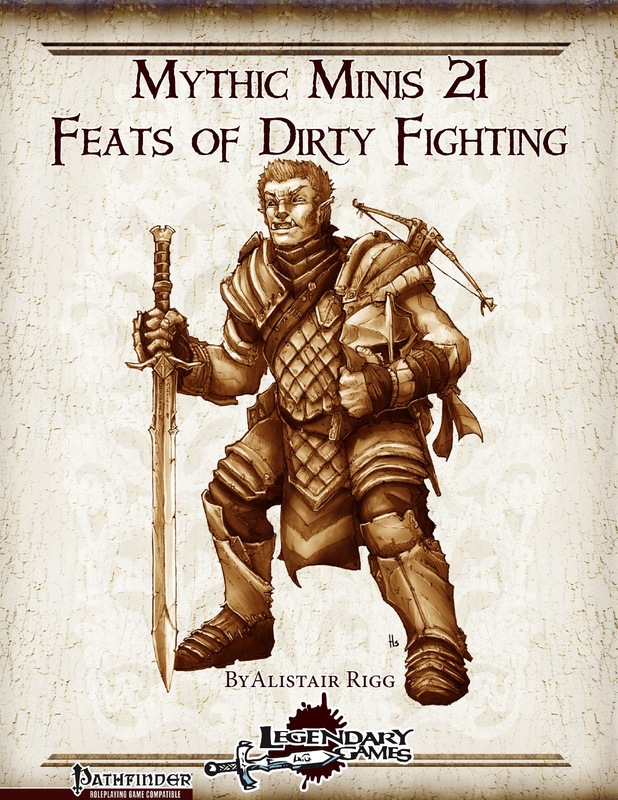 Alistair Rigg's mythic takes of dirty fighting rock - they are deadly, cool and do not follow formulaic mythic structures, instead coming with cool, unique effects that, more often than not, are inspired. Thus, my final verdict will clock in at 5 stars. Review shared on our website. Thanks for the great review as always Endy!